"An outstanding and courageous book filled with fascinating case stories. This book is truly important because children are trying to tell us about their past lives and we must not remain deaf." "....This book argues passionately for the existence of past lives and for the special abilities of young children to recall their pre-birth memories." 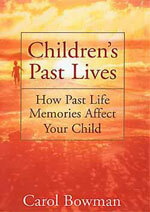 Children's Past Lives, by Carol Bowman, has broken through the mystery and sets the record straight. First published in 1997 by Bantam Books and still in print in paperback, it was the first mainstream book to identify and explain the phenomenon of children's past life memories. It's based on solid research and is full of cases and stories to show what a past life memory looks and sounds like. "Children's Past Lives is really two books in one: a memoir of Carol's discoveries after she witnessed past life memories in her own two children, and a guidebookfor parents. In 2001 she published a follow-up book, Return from Heaven, which explores cases of children's past life memory in the same family."